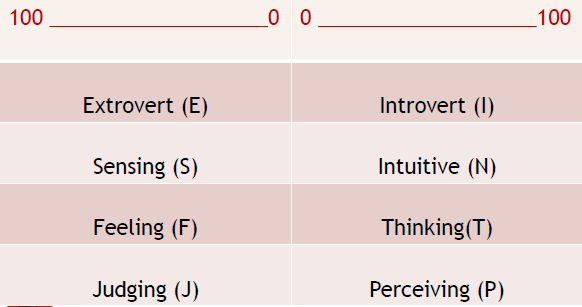 The Jung Typology is one of my favorite "tests" designed to assess a person's personality. Based on Carl Jung's research, it is the basis for the Myers Briggs Personality Type Assessment (MBTI). If you have not taken the "test," please click below to do so. Once you complete it, please make a note of your results and return back here. Now that you have identified your personality type (it should consist of four letters), yours will be one of sixteen (16) possible combinations. Click on your four letter code for more information about your "type." As you can see, it ranges from "0" in the middle to 100 at the outer ends. That is why you will see a number indicating strength of preference for each dimension. Although some people may fall in the middle (near "O"), most people fall more to one side or the other (indicating their preference) for each of the four (4) pairs. On the contrary the other 40% who are introverts, like to watch before doing, prefer working alone or with one other person and tend to like quiet space to work. Those who are sensate (approximately 65% of the population) tend to be more realistic and practical. Heavily relying on data and information received through their five senses, sensates like to use their experience and common sense, and prefer routine and order. I bet you can guess that at the other extreme, those who are intuitive are more imaginative. They like new challenges compared to routine and detail work. Intuitives account for the other 35% of the population. Feelers focus more on personal relationships. They like harmony and dislike conflict. Many times feelers will make decisions based on his/her heart. You probably would never guess this, but 65% of females and 45% of males test out as "Feelers"
Those who are "Thinkers" are more interested in fascinating ideas and are not bothered by conflict. They tend to favor logic/reason, rather than yield to or rely on emotions. Some people get "tripped" up with this dimension, especially Judging, because they think it means a person is judgmental. But that is not the case. Juding simply means the degree to which the person is decisive. Approximately 45% of the population is deemed to be judging. On the other side, a person described as perceiving tends to be curious, open to examing the options. Perceivers tend to be flexible and able to adapt easily to people and situations. At extremes, Judgers tend to make decisions too quickly and perceivers have trouble making up their minds. Please keep in mind that this "test" is NOT designed to put labels on anyone, but it does give insight into and can help promote understanding. It is NOT designed to compare one person to another, to determine which is good or which is bad. For the leader, it is designed to help you better understand your co-workers and help them better understand you. I have created an exercise based on this information that I use when conducting team building sessions. The results have been very favorable. Remember this: People are diverse; and there is value in diversity. The video below gives more detail about the Jung Typology and how Carl Jung's concepts influenced current thinking about personaly types. It sums up this topic quite well. For more, please take a look at Leadership & Styles and Personality Type Explained.